The knee is a complex joint. It contains the distal end of the femur (the femoral condyles) and the proximal end of the tibia (the tibial plateau). 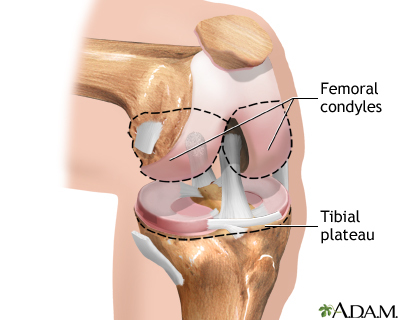 The femoral condyles usually glide smoothly on the tibial plateau. This allows the lower leg to move smoothly and painlessly. 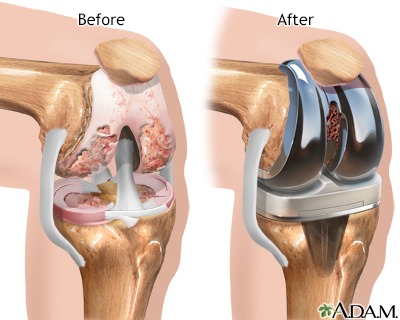 The most common cause of knee damage that leads to knee replacement is osteoarthritis. 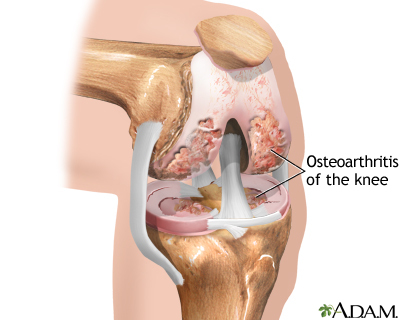 Osteoarthritis is a degenerative disease of the bones of the knee. It causes the surfaces of the knee joint to become irregular and rough, preventing smooth painless motion of the knee joint. The operation is performed under general anesthesia. The orthopedic surgeon makes an incision over the affected knee. The patella (knee cap) is moved out of the way, and the surgeon shaves the heads of the femur and tibia to remove any rough parts. This allows helps the prosthesis to adhere better. 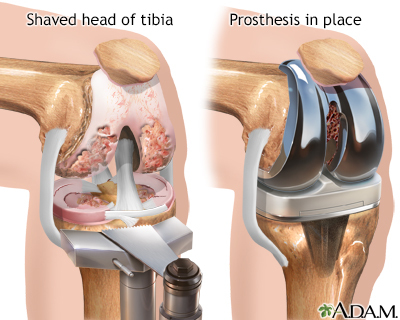 The two parts of the prosthesis are implanted into the thigh bone and the tibia bone using a special bone cement. You will return from surgery with a large dressing on the knee area. A small drainage tube will be placed during surgery to help drain excess fluids from the joint area. Your leg will be placed in a continuous passive motion (CPM) device. This mechanical device that flexes (bends) and extends (straightens) the knee at a pre-set rate and amount of bending. Gradually, the rate and amount of bending will be increased as you can tolerate it. The leg should always be in this device when you are in bed. The CPM device helps speed recovery, and decreases pain, bleeding, and infection after the operation. You will have some pain after surgery. However, you may receive intravenous (IV) medicine to control your pain for the first 3 days after surgery. The pain should gradually get better. By the third day after surgery, medicine you take by mouth may be enough to control your pain. You will also return from surgery with several IV lines in place to give you hydration and nutrition. The IV will be removed when you can drink enough fluids on your own. You will receive antibiotics to reduce the risk of developing an infection. You will also return from surgery wearing special stockings. These devices help lower your risk of getting blood clots, which are more common after lower leg surgery. You will be asked to start moving and walking early after surgery. You will be helped out of bed to a chair on the first day. When in bed, bend and straighten your ankles often. This can prevent blood clots from forming.